He was born in Ozerkov (Ozorków), near Lodz, Poland. His father was a well-known prayer leader and a scholar, but terribly poor. There were seventeen children in their home, ten sons, and all went hungry. The sons inherited from their father an inclination toward vocal music, and at the age of six Mikhl was an assistant cantor to his father. One year later, he sang with the city cantor and later with the Kutner cantor. At age fifteen he was a chorister in the great Yiddish theater in Lodz. At sixteen he was choral director at the town synagogue school. He went on to direct the Hazamir chorus in various Polish cities, and he wrote operettas for a Yiddish theatrical troupe in which he also participated. In 1912 he emigrated to the United States and became a cantor and director of the Yiddish singers’ union in Paterson, New Jersey. In 1917 he moved to New York, and from that point forward he worked as a voice teacher in the schools of the Workmen’s Circle in New York. In 1913 he published a series of articles on Jewish music in Dos idishe folk (The Jewish people) in New York, and thereafter until 1920 he was the music critic for Tog (Day) in New York, where he wrote under the pseudonyms: Ben-Arn, Mikhele Ozorkover, and Avrom Luzzato. He also contributed pieces to: Di idishe velt (The Jewish world) in Philadelphia, Idishe zhurnal (Jewish journal) in Toronto, and Kultur un dertsiung (Culture and education) and Der fraynd (The friend) in New York, among others. 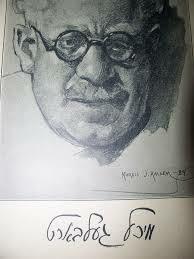 He wrote the music for works of numerous Yiddish poets and to hundreds of Yiddish children’s poems. He composed the music for six children’s operettas and compiled songbooks for the modern Jewish secular school. Sources: Zalmen Reyzen, Leksikon, vol. 1; Z. Zilbertsvayg, Leksikon fun yidishn teater (Handbook of the Yiddish theater), vol. 1; Y. Glatshteyn, in Foroys (Janbuary 21, 1933); H. Lefkovitsh, in Der tog (New York) (March 24, 1933); L. Klotsman, in Der shpigl (Buenos Aires) (March 1938); M. Yordani, in Tog (January 15, 1938); Yordani, in Proletarishe gedank (January 1942); A. Almi, in Vokhnblat (December 1942); N. Y. Gotlib, in Keneder odler (Montreal) (April 9, 1943); B. Y. Byalostotski, in Kultur un dertsiung (New York) (October 1949; November 1955); Sh. Secunda, in Forverts (New York) (March 10, 1950); Kh. L. Fuks, in Fun noentn over 3 (New York, 1957), p. 199; Bibliography of Jewish Music (New York: Columbia University Press, 1951); Lefkovitsh, in Tog-morgn-zhurnal (New York) (November 9, 1955); Lefkovitsh, in Kultur un dertsiung (November 1955).